There are many raw dog food recipes to add variety to a raw dog food diet. Just because raw foods are not cooked does not mean that there cannot be creative ways to combine foods and add flavor to a meal. Learn about creative ways to combine raw foods to make a tasty and nutritious meal for your pet. Long before the era of commercial dog food, dogs ate homemade diets and raw foods. In many ways raw diets are the most natural diet for a dog. Their ancestors hunted and foraged for food, and dogs in the wild still do. Raw diets provide more nutrition than commercial dog food and cooked homemade diets. The cooking process depletes many natural nutrients in a food item. Raw food retains its natural maximum nutritional value. Due to the high nutritional value, many dogs thrive on raw diets. 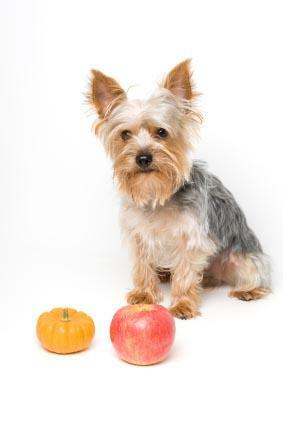 Many dogs with food allergies and health conditions improve on raw diets. Some dogs on commercial diets suffer from digestion problems and other health problems. Raw diets can help a dog receive required nutrition and avoid many problematic ingredients prevalent in commercial foods. Variety is possible with a raw diet. Try out these raw dog food recipes. Wash meat and vegetables thoroughly. Peel off carrot skin and cut into small pieces. Cut each Brussels sprout in half. Cut off chicken skin. Cut the chicken into small chunks. Slice the liver into smaller pieces. Mix the meat and vegetables together in a bowl. Stir in the bone meal, oil and garlic. Serve the food. The ingredients in the recipe provide a balanced amount of protein and nutrients. They include sources of protein, carbohydrate, fiber, vitamins A and C, iron, riboflavin, potassium, beta-carotene and fat. Wash vegetables. Peel off carrot skin. Slice carrots and broccoli into bite size bits. Shell the peanuts. Place the carrots and broccoli on a dish. Add a token amount of peanuts for flavoring. This treat provides sources of beta-carotene, calcium, potassium, vitamin C, protein and fiber. Peel the banana and cut into small pieces. Remove apple skin and slice into bite size pieces. Place the banana and apple pieces in a bowl. Add the cottage cheese. Stir together and serve. This recipe provides sources of vitamin C, pectin, calcium, protein, potassium and magnesium. Raw Food Life: The site has advice and recipes for raw dog food. Homemade Pet Foods: This blog has raw food and homemade food recipes for dogs. Shirley's Wellness Café: The site owner writes about how a raw diet saved her sick dog's life and provides raw food feeding advice. Dog Nation: The site has some raw recipes for dog food. Before feeding a dog raw foods, seek the advice of a veterinarian to make sure the diet is safe for your pet. Veterinarians can also provide helpful advice on how to create a balanced and nutritious raw food diet.Carefully select raw food and only serve it fresh. Wash each food thoroughly. Use or discard all raw food within four to six days. Never mix fresh food with old food to prevent bacterial contamination. Serve beans with care because they can cause gastrointestinal problems in some dogs. Avoid serving beans to deep-chested dogs entirely because they can produce bloating that can lead to a life-threatening condition. Feed dairy products with care. Some dogs are lactose intolerant after puppyhood. If your dog can tolerate dairy products, feed them in small amounts because they may still produce gas. Do not feed a dog spicy foods or citrus fruits. Tomatoes, peppers, cucumbers, lettuce and spinach should be fed in very small amounts because of the potential for stomach upset, gas or loose stools. Grapes and raisins should be avoided because they can cause kidney damage in dogs when fed in large amounts. Raw dog food recipes can provide helpful ideas for adding balanced nutrition and variety to a raw diet. Once you understand how to combine nutritious foods and learn your dog's preferences, it becomes easier to figure out new meal ideas. Experiment and see what works for your dog. .